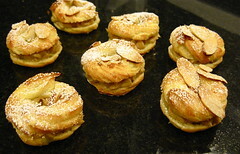 today was day two of my three-day breads, breakfast pastries, and petits fours exam. yesterday, i turned in an ok lemon pound cake. it was baked well, but apparently it was dense - a sign of over working the batter. i find this amazing, since i mixed that one by hand. getting eggs to the ribbon stage by hand will make you break a sweat. these are photos of what i turned in today. 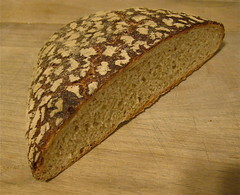 beer bread - turned out fine, could've had a more random crumb. 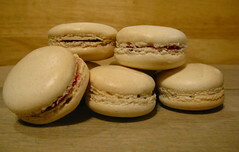 macarons with raspberry filling. these are some of the best macarons i've made so far. good timing on my part. 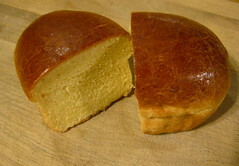 a loaf of brioche. this turned out damn near perfect. 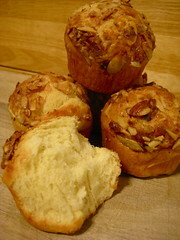 and brioche with a bee sting topping, which is basically butter, honey, and almonds. 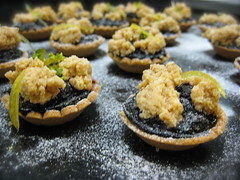 these also turned out well. 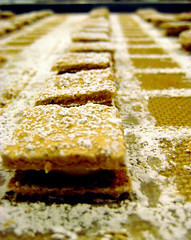 up top there are madelines, which are moist, slightly lemony tea cakes, and some apple tarts topped with a sugary almond 'nougat' mixture that isn't really like nougat at all. 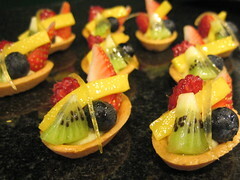 in the middle there are some mixed fruit tarts with strawberry, raspberry, mango, blueberry, and kiwi and topped with a sliver of candied lemon zest. 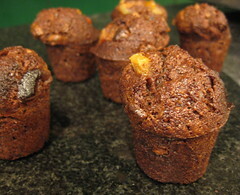 below are some chocolate financiers. 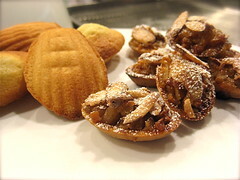 financiers are made with brown butter to give them a nutty flavor. these have some hazelnut gianduja in them along with some candied orange peel. 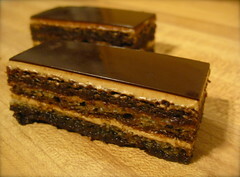 up top we have an opera cake, which is layers of spongey almond soaked with sweetened coffee syrup and layered with coffee buttercream and choccolate ganache. 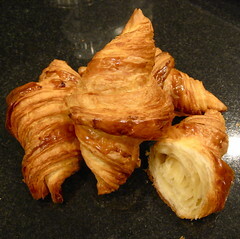 this is one of my favorites - i used to get one of these about once a week from the patisseries in versailles. 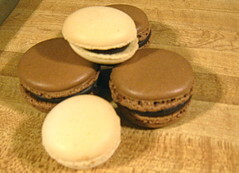 in the middle, there are some more macarons, both chocolate and plain shells, and both filled with chocolate ganache. 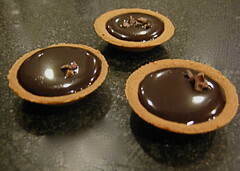 at the bottom, there are espresso mini-tarts topped with a chocolate mirror glaze. the look of them reminds me of that candy from the late 70's/early 80's - i think it was called something like toffay, or whatever, but my google-fu is not working in finding the actual name of it. in other news, exams are coming up next week. 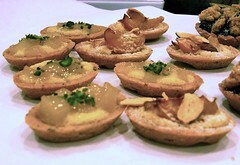 these all turned out awesome, especially the eclairs. 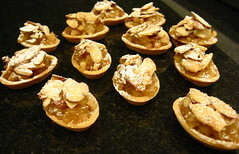 this is a petits fours that consists of two hazelnut-almond meringue-based "cookies" sandwiching a filling of pastry cream spiked with toasted walnuts and port wine.